The online Dog games recommend here are carefully handpicked, tried & tested by me and my son (Pratham) and then given a BIG Thumbs Up! 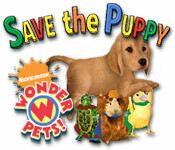 So you can be rest assured that these are the best Dog themed kids games online that one can find on the net. Also, don’t forget to check out some cool Dog Video Games and Dog Board Games here! So what are you waiting for? Have a Paw-erful gaming session with your kids! Game Learning: Time Management & Problem Solving. This kids games online is basically a time and resources management game. The story is about a Dog named Raxx who enters into a magical kid’s coloring book in which everything is drawn with colored crayons and he has to find his way back to the real world. One has to collect all the dog bones in order to cross a stage. 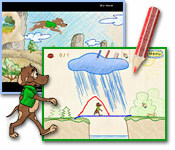 Tools like color pencils and erasers are provided in every level and the player has to utilize them optimally and help the dog (Raxx) cross the hurdles and clear that stage. Every level is short but tricky. One also has to keep track of the limited time allocated to cross that level. Tutorial mode game-play is also available in which the player is guided through the levels with the help of written on screen instructions. Game loading takes some time. No on screen timer is shown to keep track of time, so the player simply has to use his own judgment and try to cross the level as quickly as possible. The game’s background music is very soothing and instrumental type. The graphics is very unique. It seems like the kid is playing inside his own crayons color book. Game Learning: Time management & optimal utilization of available resources. The objective of this Dog themed kids games online is to open a Puppy styling shop and utilize the available resources optimally. The player has to perform Puppy grooming activities like washing, brushing, coloring the fur, drying and cutting in the shortest possible time and making the best use of the available grooming stations. The player can choose to buy new grooming stations or upgrade the existing ones by exchanging the points ($$$) earned at end of every level. The player has to increase his grooming skills and speed with each level and try to attain the status of a expert puppy stylist. There are total of 50 levels in this Dog themed kids game online. One can also participate in 9 different Dog shows. The player comes across a variety of Dogs each having its own set of traits like patience, acceptance, obedience etc. The game’s graphics and sounds are quite amusing, especially when the Dogs give their unique expressions and make different sounds depending on whether they are happy or annoyed by the way they are being handled. On screen instructions are quite helpful. Game Learning: Fine motor skills. No. of Players: Single player game. 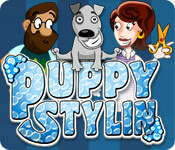 This is a very simple Dog themed kids games online for little kids. The story is about a Sparrow, a Turtle and a Guinea Pig helping out a puppy in his daily activities like going to toilet, washing the puppy, moving in and out of the dog house, finding the dog bone etc. 3 modes of game-play i.e. adventure, coloring and free play. The kid would get a new coloring sheet on successfully clearing a stage that he can print and enjoy. 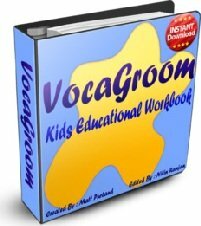 Game instruction are verbal so the little kids would find it very helpful as they don’t have to read anything. 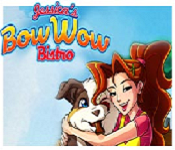 This Dog themed kids game online has a total of 6 games. The graphics of the game is very simple. The game offers 2 levels of difficulty i.e. easy and hard. Game Learning: Pattern matching, Visual skills & Logical thinking. This Dog themed kids games online is basically a visual pattern matching game. A player has to match at least 3 identical objects in order to make them collapse. The player would get one piece of the jigsaw puzzle on successful completion of a level. He has to collect all 9 pieces in order to complete the jigsaw puzzle. All the objects to be matched are related to Dogs such as, Dog bone, dog paw, dog collar, dog walker, dog food and newspaper. Power ups like bombs and hammer are provider to help the player. The graphics of this dog themed kids game online is quite beautiful. Music is also cool. Game Learning: Pattern matching & Visual skills. 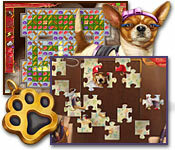 This Dog themed kids games online is basically a visual pattern matching, card solitaire game. The game offers 3 difficulty levels i.e. hard, medium and easy. 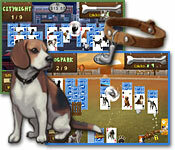 As the game progresses a player can unlock new Dog types like Golden Retriever, Dalmatian, Dachshund, Beagle etc. One can buy various Dog accessories from the Pet shop by spending the points ($$$) earned during the previous levels. On screen instructions are very helpful. The objective of this Dog themed kids games online is to open a Dogs & Cats styling shop and utilize the available resources optimally. The player has to perform pet grooming activities like washing, brushing, drying and cutting in the shortest possible time and making the best use of the available grooming stations. 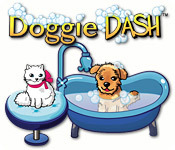 The player has to increase his grooming skills and speed with each level and try to attain the status of a expert pet stylist. Two modes of game-play i.e. story mode and endless shift mode. The game’s graphics and sounds are quite amusing, especially when the Dogs & Cats give their unique expressions and make different sounds depending on whether they are happy or annoyed by the way they are being handled. The objective of this Dog themed kids games online is to open a Dog food bakery shop and utilize the available resources optimally. The player has to perform activities like baking, icing, topping, cooking billing etc. in the shortest possible time and making the best use of the available cooking stations. The player can choose to buy new cooking stations or upgrade the existing ones by exchanging the points ($$$) earned at end of every level. The player has to increase his grooming skills and speed with each level and try to attain the status of a expert Dog food baker. Depending on his performance, the player could earn either silver or a gold medal. A player gets special power up from time to time to help him increase his efficiency. One can also participate in 10 different Dog food sales. The game’s graphics and sounds are quite amusing, especially when the customer give their unique expressions and make different sounds depending on whether they are happy or annoyed by the way they are being served. On screen instructions of this Dog themed kids games online are quite helpful. Have you enjoyed these Dog themed kids games online?